Coconut Crab size can reach up to 1 meter. 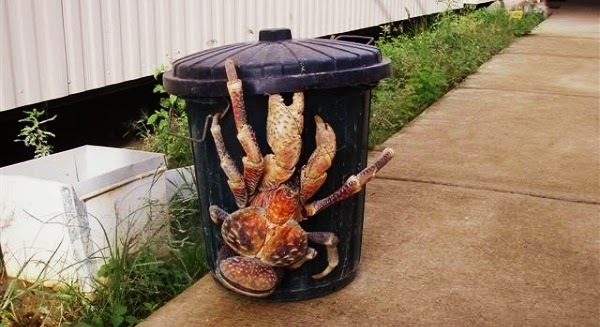 Coconut crab (Cancer crumentus) also known as coconut thief, not living in the sea as well as red crabs, but live near the beach to make sure it is not too far from the source of water - the sea. Coconut crabs are of the same type of a hermit crab where during young its needs other protection such as snails shells to keep them from being eaten by other predators. This is because the adult female crabs will release the eggs on the beach and in the sea where the crab’s young will spend time until they become adult and live on land as well. But the crabs should ensure their body moisture remains to prevent them from dying. 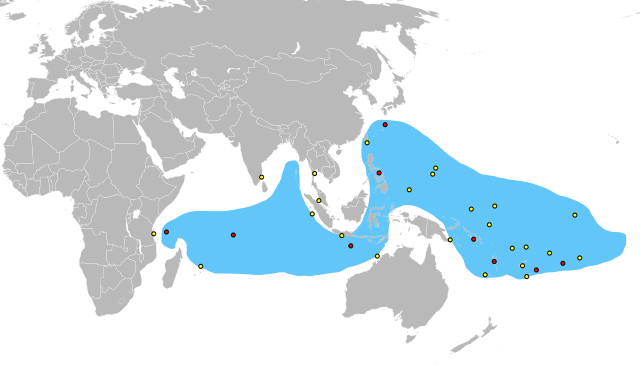 The area where the Coconut Crab can be found. The most interesting about coconut crab is also an advantage to this species to any other crabs is the ability of climbing the coconut tree. That is why he was given the title of 'Coconut Thieves Crab'. This is because the coconut crab climbs the tree when the day began to cool down and when the day is getting dark. So if you're on the beach at night under a palm tree maybe you should not be afraid if there is something on the tree. It maybe a coconut crab is enjoying his favorite food - the coconut. Coconut Crabs color varies from red to blue. The coconut crab habitat is in the coastal of small islands in East Africa up to the South Pacific. 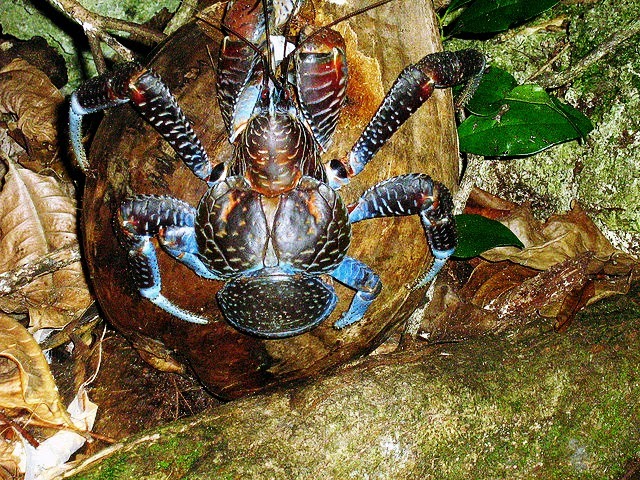 Coconut crab considered as delicacy by human so it is less common in areas inhabited by humans. 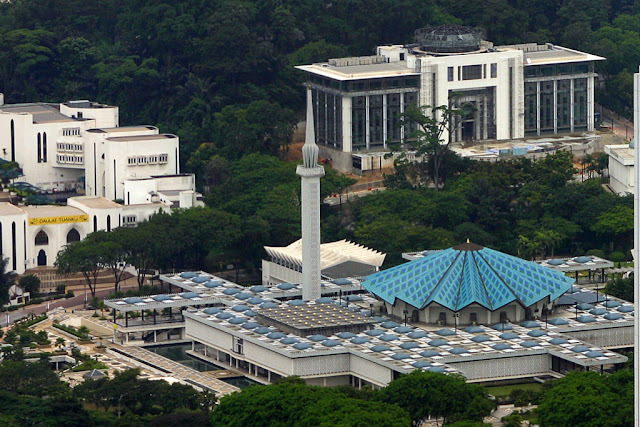 Due to the slow growth rate, the number is decreasing day by day. Size of an adult coconut crab can reach up to 1 meter (3 feet) from foot to foot with foot weight of 4.1 kg (9 lb). It also can achieve up to 60 years of age. If you recall sea animals such as giant clams that are also has a long life that can reach up to hundreds of years old. Coconut crab and coconut that might be it's food. Once the eggs are hatched at sea, crab larvae will live in shallow coastal areas about 3-4 weeks and then it will stay on the seabed using shells snails as protection. Crab reaches maturity when it’s reaching the age of 5 years old. Given these, crabs require a long time to reach a maturity age and it takes few more years to reach suitable size to be eaten by human. It is not worth it, if it became a favorite food. Maybe people did not have much choice and the taste of crab meat is typical unless if it’s prepared with other ingredients and spices with suitable cooking methods. Coconut crabs climb coconut trees. Coconut crabs can still be found on certain Pacific Islands where today it is respected as one of the creatures that have the function to keep the balance of nature. 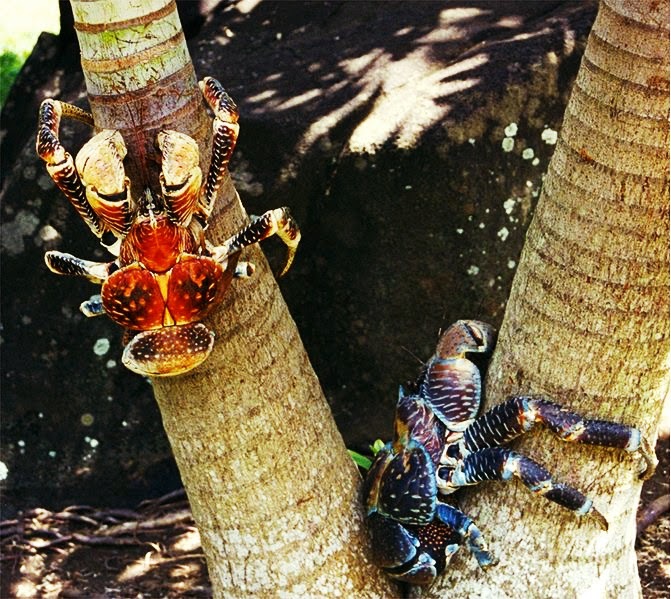 What is important for us to recognize this unique crab that is not just live on the land but also can climb coconut trees that is impossible for the other crabs! Do you want to see this crab in their habitat someday?